Cyril Christo & Marie Wilkinson to screen “Lysander’s Song” as part of the Wildlife Conservation Film Festival in New York City on October 20th, 2013 at the New York Institute of Technology Auditorium, 1871 Broadway. The film will be screened as part of a program of shorts on African wildlife issues and will start at 10:30 am. A discussion will follow the screenings. Books will be available for sale. The Lensic and WildEarth Guardians present: The Future of Wild: Elephants and Wolves, featuring the short documentary film, Lysander’s Song by Cyril Christo & Marie Wilkinson. The Lensic Theatre on April 25th, 2012 in Santa Fe, NM. The program begins at 7 pm and a Q & A will follow. 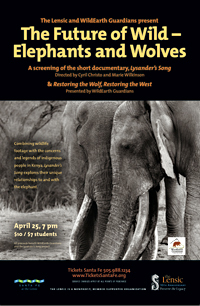 The Lensic and WildEarth Guardians present an evening dedicated to the future of wild elephants and wolves on April 25. The event features the short documentary, Lysander’s Song, directed by the photo-documentarians Cyril Christo and Marie Wilkinson. The film explores the complex and deeply-rooted relationships between the native tribespeople of Kenya and the elephant. The husband and wife team have exposed the degradation of the natural world since 1996, first with the book, Lost Africa (2004), on the tribes of East Africa, and Walking Thunder (2009), about the decimation of the African elephant. Their work brought the slaughter of Africa’s elephants to the attention of the editors at Vanity Fair. In August 2011, the magazine published the searing investigative feature, Agony and Ivory, by writer Alex Shoumatoff about the tens of thousands of elephants massacred because of the demand for ivory amongst China’s newly rich. Today, the couple is screening Lysander’s Song at select venues around the U.S. The film addresses the question, “What does the future of the elephant have to do with the future of childhood?” The answer: “Everything.” Combining wildlife footage with the concerns and legends of indigenous people in Kenya, the film explores their unique relationships to and with the elephant. Elaborating on the Samburu people’s totem and the unique role the elephant plays in their belief system, Lysander’s Song emphasizes the essential role of the non-human in the human mind and spiritual ecology. The film considers wildlife to be an essential part of our identity. Carol Norton, Associate Director of WildEarth Guardians will provide an introduction and a short film presentation of the video, Restoring the Wolf, Restoring the Wild, a photo essay narrated by Alan Arkin. A discussion with Lysander’s Song filmmakers Cyril Christo and Marie Wilkinson follows the program. All proceeds benefit WildEarth Guardians and the Lysander’s Song project. 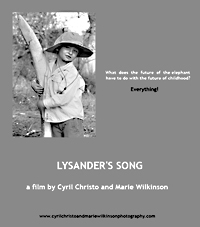 Cyril Christo & Marie Wilkinson to screen “Lysander’s Song” as part of the Environmental Film Festival in the Nation’s Capital on March 25th, 2012 at the Carnegie Institution of Science. The film will be screened as part of a program of shorts on International environmental issues and will start at 2:00 pm. Renowned photographers and documentarians Cyril Christo and Marie Wilkinson will be speaking about their life’s work saving the elephant from extinction at the Annenberg Space for Photography on November 11, 2010 at 7 PM. IN THE FOOTSTEPS OF GIANTS: The Last Stand of the African Elephant will outline Christo and Wilkinson’s work with the dwindling elephant population and their struggle to convey the message of this dire situation to the world at large. CYRIL CHRISTO is a poet, photographer and documentary filmmaker, whose film, A STITCH FOR TIME (an anti-nuclear documentary), was nominated for an Academy Award in 1988. MARIE WILKINSON is an architect, planner, and photographer. Together, the two have documented their passion for the elephant most recently in a book entitled, WALKING THUNDER: IN THE FOOTSTEPS OF THE AFRICAN ELEPHANT (Merrell 2009), which placed in the top two for Nature Photography Book at the 2010 International Photography Awards and is the first all black and white manifesto dedicated to the elephant. In 2008, their book, LOST AFRICA: THE EYES OF ORIGIN (Assouline 2004), also placed in the top two for Fine Art Photography Book at the International Photography Awards. A documentary entitled THE LAST STAND OF THE AFRICAN ELEPHANT is now in the works. In Predatory Light: Lions and Tigers and Polar Bears (Merrell, 2013) haunt like the dissolving edges of a gripping dream. This new book by art and conservation power couple Cyril Christo and Marie Wilkinson pays tribute to a shocking truth: On the cusps of this fragile planet, the great predators are dying.